: Target airborne creature gains +3|-1. "Inspiration will come today, but don't hold your breathe"
"Its a good day to go with the flow today, so soar high and keep the winds at your back!" 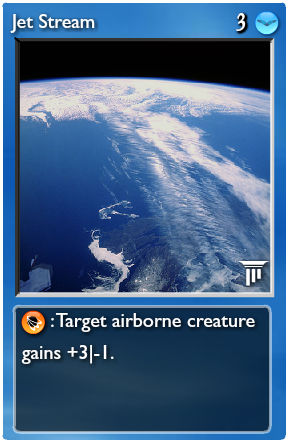 UPDATE: Card post updated to match the version currently implemented under openEtG. Its a "semi-overdrive" on a stick. Unlike overdrive / accelerate, there is no lobo effect attached, but it may still find some use as CC vs small creatures. Should be very good when combined with dive, yet stay balanced due to the relatively low HP of pegs and wyrmms. 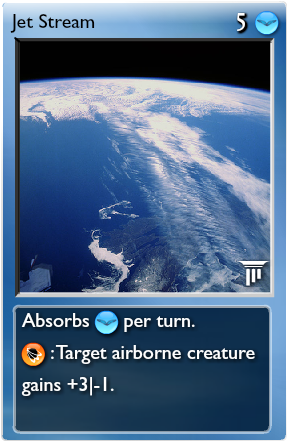 Made as an air analogue to the waterfall card proposed a while back and currently implemented in oEtG (waterfall gives momentum). : Target airborne creature gains +2|-1. pretty sure you could get away with making this a lot cheaper/ more powerful. 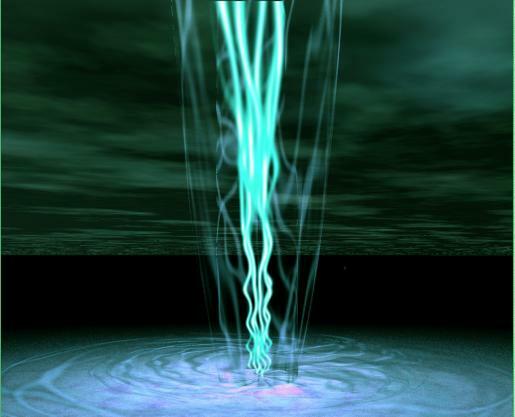 Alone the upkeep of two different types of quanta and 1 health per turn are barely worth 2 or 3 attack. Alternatively you could have it affect ALL airborne creatures. Ya... 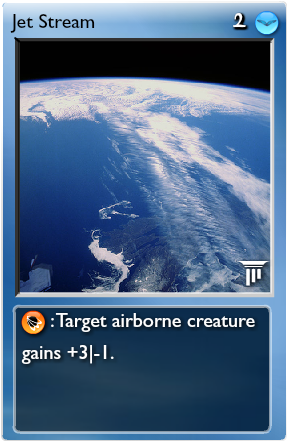 I was thinking of having it affect all airborne creatures... but I have a feeling there would be an awful lot of people screaming OP if I did... Partly because it ends up becoming a mass CC on a stick. With 3 in play at once, you effectively have a RoF every turn. Then just snipe or shockwave the stragglers. Wings keeps any ground dwellers that aren't affected at bay. Alternately, the combo with wyrms / pegasi and blitz gets VERY upgly. Upgraded, they can handle 3 hits from this, yielding +9 ATK each. Then throw in dive and blitz on top. That gives +36 each. Very quickly adds up to an OTK. I can drop the upkeep or cost... or both... if it seems like too much though. Ya, I was erring on the side of expensive... I'll bring the cost down a bit I think... or should the upkeep just get dropped instead? I think that this card could see a reduction to a 2 or even 1 cost, since it demands a duo and consumes per turn. The unupped ability could even see a boost to +3|+1 IMO, and still wouldn't be too strong. Put up a poll for balancing. To be fair, I think that the upkeep balances the fact that this gives a controllable and Lobo-immune Acceleration and Overdrive. However, I feel like it could cost 2|3 and be balanced. Updated to match what is currently implemented under oEtG. Bumping for feed back now that Cygnia is in. 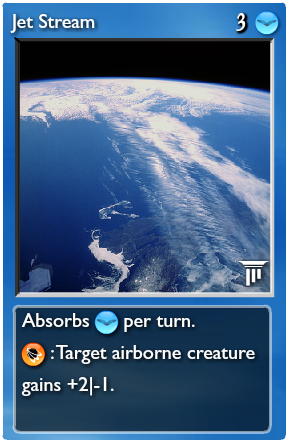 This card made it into openEtG, so it should be fairly easy to implement.